Australian Money Market Pty Ltd (AMM) is a private company that was established in 2007 to run an online cash deposit broking business. We built our online platform to facilitate the trading of term deposits from one place, thereby eliminating the paperwork that would normally be required for every term deposit trade. Having over 20 financial institutions on board who offer term deposit investment opportunities, AMM has become the first port of call for thousands of investors. $5 billion across over 30,000 deposits. Our business continues to grow through referrals from our clients who like what we do and enjoy the benefits that our flexible term deposit trading platform offers. Australian Money Market Pty Ltd (AMM) are licenced as a corporate authorised representative (No. 338682) under DDH Graham Limited (AFSL No.226319), a funds management and administration organisation. Established in 1981, DDH manages and administers over $11 billion in funds nationally on behalf of financial intermediaries and other financial service partners. For more about DDH Graham Ltd, please click here. To view AMM's Financial Services Guide (FSG) to understand the services we can offer you, please click here. Ugo is joint managing director of DDH Graham Limited, a Brisbane based funds management and administration organisation. Working in various financial markets roles for the past 30 years, including several years in an executive money market role, Ugo is able to bring a wealth of administrative expertise to AMM and a wide breadth of banking product knowledge and contacts. Tony is a director of Pharos Group - a private equity venture that seeks to develop or establish equity holdings in businesses which support or enable the provision of advice and financial services. Tony has over 25 years of experience in the Australian financial services Industry. He has held executive roles in two of the world's largest financial services organisations, and managed and established several highly regarded distribution groups. Tony brings his expansive knowledge of financial planning practices to AMM along with a vast network of industry contacts..
Our business relies on our trusted industry partnerships. We would like to introduce you to who they are. We currently partner with over 20 different Australian banks, building societies and credit unions, all Approved Deposit Institutions covered by the Government Guarantee. We partner with the following cash management account providers to facilitate the settlement of term deposit deals. The cash management account acts as a hub to the system and enables AMM to easily move funds between financial institutions. We partner with other platforms and self-managed super fund administrators where Australian Money Market becomes the term deposit hub. We can setup feeds and a white label version of the platform under a company's brand if required. Contact us to discuss. We partner with financial planning software providers and platforms to streamline even more of the administration and setup data feeds with the platform. We partner with a large number of Australian financial planner dealer groups and advisory firms whose clients are generally self-managed superannuation funds, individuals and other trusts. They see the benefits of our platform in saving them time and money while at the same time maximising returns in managing their client’s cash deposits. This is particularly the case for self-managed superannuation specialists and their clients. Minimum 128-bit SSl encryption for the transmission of data so you can rest assured your information is secure. It is important that you feel confident about the security of personal information. The information required to open an account is stored securely within our database. We do not use the details for any other purpose unless specifically instructed. We follow strict security procedures in both the storage and disclosure of personal information. The investment is always in the name of the client. Funds are always contained in accounts held with financial institutions in the client's name and can only be transferred into an account of the same name. Ownership of the funds cannot be transferred to anyone else. Australian Money Market does not hold any monies on trust for clients. When an investment option is selected, the Bank with whom the cash management account is held is instructed to send the funds according to the Standard Settlement Instructions (SSIs) of the chosen institution. Stringent checking processes are in place to ensure funds can only be sent to the SSIs of each institution. All the banks, building societies and credit unions that we deal with are covered by the Government Guarantee Scheme up to an investment amount of up to $250,000 per entity and institution. When placing deposits on the Australian Money Market platform, you can spread the funds across institutions to maximise the benefits of the Government Guarantee. ALL the financial institutions we deal with are covered by the Government Guarantee. 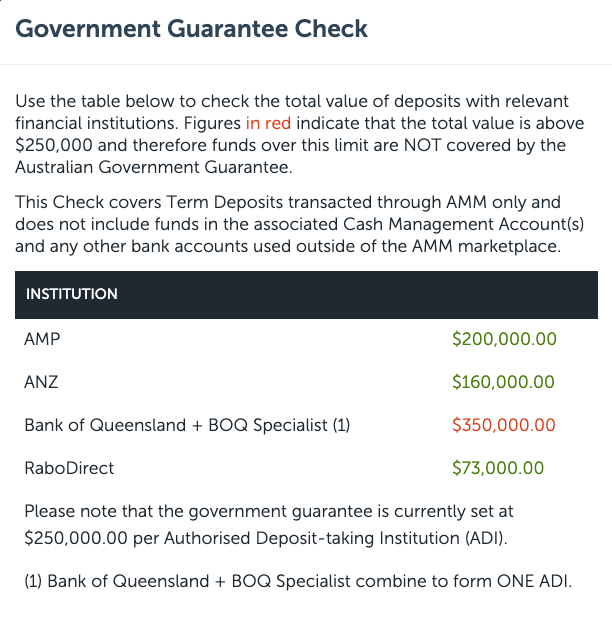 The guarantee covers deposits up to $250,000 in Authorised Deposit-taking Institutions (ADIs). The cap applies per entity, per ADI. If you place $250,000 with one ADI and $250,000 with another, then both of the deposits are guaranteed. If you place more than $250,000 with one ADI, then only up to $250,000 is guaranteed. In the case of joint accounts, each account holder is entitled to an individual guarantee up to $250,000. Within your AMM Account page, you can check your fund allocations across institutions by clicking on the Government Guarantee Check link.